So we had arrived in Gondar; the bikes were rested and after swapping hotels a few times, we got to know the town a little better. Tej (honey wine) is also very popular; it’s pretty good, but make sure you get it for a fair price – somewhere around 30 Birr is good. But as nice as it was, I preferred to stick to the beers. Getting used to local eateries was also a keen pastime of mine. The Italian influence in Ethiopia is still present and Gondar certainly not excluded. Local cake & pastry shops are a plenty, Buna Bets (Coffee Houses) are everywhere and believe you me, if you like coffee, you will love Ethiopia. Coffee ceremonies are common in people’s houses; fresh beans roasted in front of you then coffee’s served in small cups – it’s amazing and a real treat if you’re offered it; don’t turn it down. As mentioned in my previous blog post, after a few days in Gondar I was speaking to one of “the boys” – many of whom float around the central Piazza in Gondar trying to make a bit of money off foreigners. I spoke with him and mentioned that we wanted to visit the Debre Birhan Selassie Church and, after that, pop in and see Yenege Tesfa if that was possible. He arranged it and the next day we met up to see the church, which is wonderful. A very old, tranquil and inspiring church on the top of a hill towards the North of Gondar. Many folks asked me if it’s worth a visit and my answer would always be, most definitely. Its roof is painted with beautiful angels and the oil paintings inside will leave you starring at them in thought for quite a while. It is a sacred and wonderful place only costing 50 Birr (£2) to get in. After the church, we then walked back towards Yenege Tesfa where Nigisti had kindly agreed to meet us – on her only day off. We entered the office and we got talking; we explained what we were doing and were super keen to learn about the work she’s been doing. Nigisti setup Yenege Tesfa (Amharic for Hope for Tomorrow) at the age of 21 and has made it her full time job ever since; fundraising and working on behalf of the street children in Gondar. But mentally it can be very difficult; there are times of frustration at simply wanting to do more. Whilst there’s of course immense benefit that you help the children you do help; there are thousands of street children in and around Gondar; and that’s just Gondar – Ethiopia is a very large country, with a population topping 80 million. Being able to help all with the limited resources is simply not possible – so it was evident that the feeling of guilt outweighed the reward from helping the children she so selflessly does. Our initial meeting was very open and honest; Dan and I discussed how we could help and, initially at least, it seemed apparent we could assist with the Website (www.yenegetesfa.org). The current one had been online for a few years but hadn’t been updated for a while; websites always need updating so we set to work on that. Dan inspired a new design and scheme, whilst I got to work on the “coding” and behind the scenes “stuff”. A week into development work, we also talked about taking on the website project for Bidna Capoeira, now an officially registered UK charity and organisation currently working in Damascus, Syria. As that project was moving from strength to strength, they too needed a website to help reflect the excellent progress. Whilst Dan was in Syria, he had spent a lot of time designing and scoping the website for Bidna. However, at the time of our discussion progress had been very slow and the site simply wasn’t taking shape in the manner or timeframe Dan had wished. So, a decision was made – we’d develop both websites together. It made sense; both sites would have very similar “components” – ability to sign up for mailing lists, blog integration and the ability for photos uploaded via flickr to magically appear on the website. So I set to work on these “components” in order to make them as reusable as possible. Given our strengths in this area it’s very possible that we’ll do more websites down the line, so designing and making the website as reusable as possible was a key objective. The site took shape, we got positive feedback from others involved in the Yenege Tesfa project and on the 15th October, 2010 (2003 in Ethiopia) the new website was launched. Hibste, now good friend of ours and also Chairman of Yenege Tesfa, kindly took us out that morning for Juice & Cake, so we were very grateful for that. We’re both really satisfied with the website and are grateful for all the positive comments received. Another bonus is that there were almost no costs in developing the Website; Dan and I already pay a fixed fee for website hosting so were able to use that for Yenege Tesfa. The Domain (www.yenegetesfa.org) had to be renewed and we ordered a few computer peripherals to help the office run a little more smoothly, ensuring data is backed up etc, but all that came in at under £100. But whilst we’d set aside time to work on the web based projects, mainly working through the night as that’s when the Internet was working best (Internet speeds in Ethiopia are generally very slow), we also got to know the truly wonderful children; the very reason Yenege Tesfa exists. There are two shelters; one for the boys, one for the girls. The boys’ shelter is the oldest, having been established for about 7 years. It’s a mud built house, but it comes with a great outside area for the boys to enjoy meals together, chat and socialise. It also has fantastic views over the Ethiopian landscape – but to be honest it’s not hard to get a wonderful view in Ethiopia; the country is geologically stunning. The girls’ shelter, which recently celebrated its one year anniversary, is newer. A concrete built house, it too is able to accommodate 16 girls and has a dorm area, kitchen, dining and utility area. Both shelters have a vegetable/herb garden that’s maintained by the kids with the produce used in the cooking. From football with the boys, to homework help, taekwondo and generally playing around with both groups it was immense fun. They’re such wonderful kids you can’t but help become attached to them. Once a month or so they’d put on a drama. Topics would range from bullying to child abuse or HIV- they were very meaningful topics and wonderful to see the kids sharing their views with us – not to mention working and interacting with one another. Sometimes, admittedly, there didn’t seem to any theme – rather an endless roll of various enactments; but we didn’t mind – it was all good fun! The key project now being worked on by Yenege Tesfa is “Home for Tomorrow”. Whilst it’s amazing being able to support 32 children, there are many more that need help. Life on the street is grim; mal-nutrition, HIV, poor health and low self esteem very sadly mean that many of these children live short lives. With the help of projects live Yenege Tesfa their outlook changes dramatically. They learn to survive for themselves and are given the education, nutrition and love they need to move forward with their lives. In an ideal world of course there’d be no orphanages; children would return to their families or live with foster families in a home environment; but that’s not always possible. Reunification or family settlement is a key part of any child organisation, but shelters & orphanages provide a very cost effective way to help a large number of children. The Home for Tomorrow project aims to up the capacity of Yenege Tesfa to around 250 children, which is a huge undertaking but wonderful ambition. In order to do this land needs to be sourced and “small village” designed to recreate a home atmosphere where children live in houses, rather than simply a big compound. Food, sanitation and communal areas all need consideration. Home for Tomorrow will also include skills workshops where the children can learn key skills such as woodwork, health, sewing, cooking – enhancing the education given to them from School so they can help build a career for themselves and, ultimately, stand on their own two feet to go on a build a family of their own. The project needs help and support to grow; it won’t happen without it. But with Nigisti at the helm, the enthusiasm & heart-melting smile of the children, continual support of donations, aid and helpers, it has a fantastic chance. We really hope it will happen; we believe it will, it’s nothing less than what the children deserve, but there’s a long way to go. With a cycle from the border with Sudan complete, we already had first experience of just how up and down the roads can go in Ethiopia. But cycling apart, we had other difficulties to overcome; but not before a great moment. Late one evening, we met with a local boy who simply wanted to talk in English with us; he also wanted to see if we could help him buy a physics book – but that aside we met for a coffee and talked (we also paid for his Physics book, but we tend to steer away from one-off gifts). As we did, two other slightly weary looking cyclists rolled down the hill and saw us. To our surprise they knew who we were; they had followed our blog and so knew more about us than we did about them! Anyway, let me introduce you; two wonderful Kiwis, Will & Caz. They’d been cycling from Turkey and having had a difficult and stressful start in Ethiopia, had made it to Gondar. Over the next few days and weeks, we got on really well and shared experiences of the cycle south from Egypt. I also mentioned to them that we were getting a few items sent out from the UK in an aid package, so if they needed anything we could arrange. They needed a few items so we added to the list; they then went off to the Simien Mountains for a trek and Dan & I continued our work in Gondar. Ordering the items was straight forward and they were all delivered to my super supportive friend, Veronica, who diligently packed and organised them into boxes ready for shipping. Our shipping company, TNT, kindly offered us a charitable discount – which we were grateful for as keeping the costs low is, obviously, a key priority of any charitable undertaking. It started well, but like cycling from the top of an Ethiopian mountain, it went downhill fast. We struggled to get our account setup, despite numerous emails and correspondence to the black hole that is customer enquiries. But account number in hand, eventually, we thought we were ready to go. Sadly not; upon a call to the UK “order hotline” Veronica asked if they shipped to Ethiopia; the response was “we think so”. Hmm, ominous start. DHL had an office here so we knew we hadn’t switched planets; so we enquired further; “where do you deliver to in Ethiopia”. “I don’t know, can you name a city and I’ll have look?” So we went through the cities to get a best match; hardly a good use of a database system! After Veronica had gratefully recited most of Google maps down the phone, we set on Addis Ababa as the delivery destination. It’s the capital city, but over 1,000km from Gondar so we decided, upon advice, to have the package sent by TNT to DHL in Addis so they’d courier it from there. Needless to say, that didn’t work out. We had clear documentation from the Ethiopian Government & Charity Commission stating that Yenege Tesfa is a charity so most items should be exempt from import duty, but TNT failed with glorious success on getting this approved. It may well be on reflection that this in part was a difficulty with the seemingly notorious Ethiopian Customs, but TNT had assured us all would be OK and were so lackadaisical in communication that frankly the blame and buck stops with them. Weeks went past before, giving up on releasing it from Ethiopian Customs, I got on a bus down to TNT’s office in Addis Ababa. We had also been informed that TNT didn’t understand the DHL address, so I hoped to clear that up at the same time – but in all likelihood I’d take the packages back with me on the bus. The bus journey from Gondar to Addis (about 300 Birr – Sky or Selam busses are your best bet) is quite a marvel, despite being around 13-15hrs. The Blue Nile gorge with a descent and then accent of around 1,000 meters yet again shows off the sheer scale of geology out here. The buses drives fast, but not as fast or crazy as some of the heavily over laden trucks that also plough the route. Unfortunately, your journey will probably include the sight of at least one overturned truck, or as I saw a few times, an overturned truck that has since rolled down the valley. The next day I trotted off to TNT and guess who’s next door – yep, DHL! Anyway, laughable moment over I went over to the TNT office near the airport to try and retrieve our package. It was going to be impossible to avoid paying the customs tax without waiting an eternity or risk paying increased storage charges. So, regrettably, I paid the tax – which on some items was almost equivalent to their value; good forward thinking policy that one Ethiopia. I was going to keep the delivery company, TNT, anonymous in this post as they did give us a discount – which we are grateful for. But they were so utterly incompetent, unhelpful and shockingly disorganised on almost everything they did that it’s only right I make it clear just how bad they are; they need to know so they can improve, that’s only fair. Discount or no discount, I can’t say I’ll be using them again as the stress or time wasting is simply not worth it. To cement this view, another, more comical moment actually occurred later in the trip, but we asked TNT if they could send a bicycle component back to the UK; TNT advised that the order would need to be placed by the bike shop in the UK. What? Or, we could place the order with TNT in UK; but when we asked if we could phone and place the order, they told us this too isn’t possible as their phone has no credit, or indeed a connection. Oh dear; oh dear, oh dear; yep – avoid. As a comparison we popped next door to the seemingly unknown and invisible address of DHL, and were told within minutes it’d cost £30 and could be sent that day. The process, I thought, would be fairly straight forward; however, I’d need to make an admission as Dan and I had made a mistake (which in fairness we kind of knew about). Ethiopian Visas are valid from date of issue, not entry – so ours had expired by about 16 days. We thought we’d be able to explain and apologise for this – which we did, but it wasn’t in an office, it was in front of a judge, in Court. Sadly it didn’t go very well; the shambolicly organised, but yet vaguely systematic (every stage takes at least one day) process went slowly, but on each visit the prospect looked grim. I was hoping to renew Dan’s visa without him having to come to Addis, but all hopes of that were dashed and he needed to get on a bus. The days and court appearances passed, fines were paid and at the end of it, instead of getting a new visa, were told the visa would only be issued for 10 days at a cost of $40 (after paying an £80 fine). The visa could not be renewed after the 10 days; our bikes were in Gondar and there was no way we’d make it work. We had to leave Ethiopia. We looked at getting at train to Djibouti (which is possible from Dire Dawa), but that required a visa in advance ($50), which also requires a letter of recommendation from the British Embassy – which costs £60. Fearing bankruptcy, we abandoned that option and decided to fly with Ethiopian Airlines from Addis to Djibouti. Djibouti, a small French speaking slice of West Africa in East Africa, is kind of a strange place. I can’t say I was that taken by it, but it was interesting and the market quite fascinating. Dan had a better time than I did as he opted to try and swim with Whale Sharks – which he did, even if it was just a baby one. I needed to keep costs down, but still enjoyed a Stella Artois beer that night, even if it cost £5. Djibouti is ridiculously expensive; I have no idea why, but it is. I’d imagine if you had a bit more time and the facility to go over to Lake Assal you could make a great trip of it – but Djibouti was simply somewhere I had to go before flying back. Still, interesting to see it, but I won’t be rushing back…but then you never know! We flew back and a brand new 30 Day Ethiopian visa was painlessly issued by very friendly immigration officials – just $20. Mission accomplished! In fairness, despite the ridiculous process (and yes, it was ridiculous), we were at fault as our Visa had expired; it’s common knowledge and fairly obvious you renew them before they expire, so wrist slapped and tail between our legs we prepared to depart Addis. The next day we headed back to Gondar, aid package in hand and full of smiles – it had taken about 3 weeks, we’d seen another country and been to court, but what we needed to do was now, finally, done. But we didn’t have much time left; we needed to wrap up our work at Yenege Tesfa before tearfully moving on with the cycle. My good friends Veronica & Eve were due to join us in Mombasa (Kenya); Gondar is a small matter of 2,500 kms north and we had a huge cycle ahead of us. Working at Yenege Tesfa is, quite possibly, one of the best things I’ve ever done. It’s something you see often on the TV; folks working with children in Africa – but believe you me its one of the most rewarding things I’ve ever undertaken. The children are individual marvels in their own right; they have very little, but give you everything – it’s fair to say I feel they gave more to me than I gave to them; but well, another totally acceptable “win, win” situation. At the end of our week all the children got together and we were joined by two kind Brazilian overlanders who had just donated their bikes to Yenege Tesfa. We had a wonderful evening of coffee, music and spending time with the kids before the news broke that Dan & I were leaving. At that moment I felt sick; it was an odd feeling, but in the small 3 months I’d been there I’d become very attached to the kids. There were teary eyes abounded but we all said goodbye. I couldn’t make any promises of when, or if I’d return, but it’s something I most sincerely hope to do in the not too distant future; but not before I get to Cape Town by bicycle. 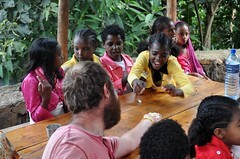 I had become attached to the kids, but Dan had fallen in love with Nigisti, the founder of Yenege Tesfa. A wonderful outcome of our time there, but whatever attachment I was feeling to Gondar, Dans’ was clearly multiplied; so I felt for him as bleary eyed at 7AM 2 later days we cycled off into the mist soaked valley of Gondar; our destination Lalibela. Nigisti tearfully and heart-warmingly said as we left “why everybody always leave?” A sad moment instilled forever; whilst I wasn’t able to offer an answer (except a hug), life teaches us that the best ones might just come back.